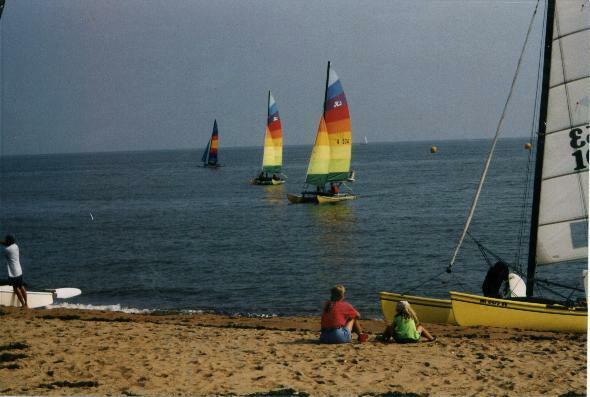 Fleet 136 has a long history of friendly and fun Hobie sailing. Many of you know commodore Joe "Wild Thing" Manganello from the past. Joe is still around the Madison Surf Club and runs the Sharing The Wind Sailing School as well as a weekly Wednesday and Friday night monohull and catamaran race series (small entry fee per race night or seasonal entry fee). Any sailors are welcome to come down to the Surf Club and join in either by participating in these FUN races or by just coming down on a weekend and sailing. Directions to the Madison Surf Club: I-95 Exit 61, After exit head south on route 79, take a right onto route 1, follow past town green and take 3rd left right before the Madison Country Club, take the first right and at end of access road continue straight through the admission booth, bear right and take a left and go past the main parking lot and continue straight and you will see the boats. Feel free to contact fleet vice commodore Todd Riccardi by email at wildtsail@aol.com if you have any other questions. ***Side note: The information on this site has not been recently updated but news and schedules of updated are information can be found through the Division 12 website.